Jessica and I thought it would be cool to make a different kind of cake, so we made a zebra-striped one. 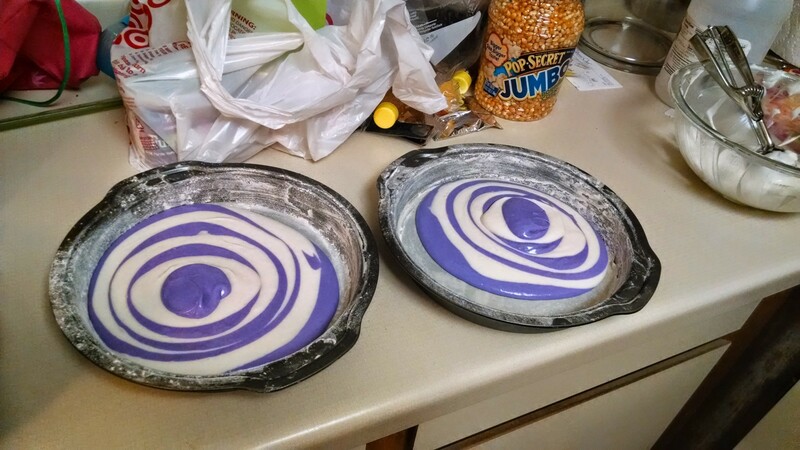 We separated the batter into two bowls — one colored purple, and one left white. Then in two cake pans, we dropped alternating colored cupfuls, letting each spread out on its own. When the two pans were cool after being baked in the oven, we stacked them and frosted them. I think our first attempt at a zebra cake turned out pretty well. My lettering, on the other hand, did not turn out so well. But that’s okay — I’m pretty sure Namine didn’t mind. Before Jessica and I headed off to bed, I set out all of Namine’s “new” My Little Pony figures and house. I say “new” in quotations because they’re generation one ponies, but they’re new to her. I may have played with them a bit before leaving them for the night. 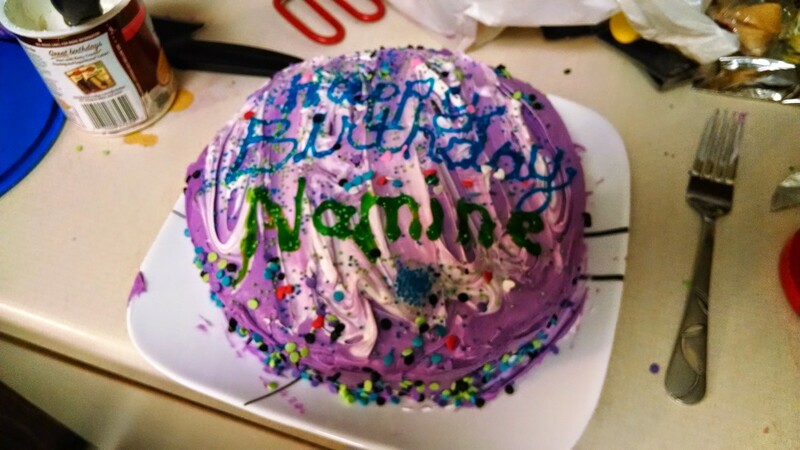 When Namine woke up this morning, we met her in the living room, where her cake and ponies were waiting. “Holy mackerel!” she shouted. She was thrilled. She opened her cards — one meows “Happy Birthday” — ate some cake, and played with her new toys. Love that story. Happy Birthday, Namine! Happy birthday my sweet Namine. Love you dear child of God!!! A very happy Birthday to your little princess!